New Year's Eve: THREE BAND NIGHT SPECTACULAR! THREE HEADLINING BANDS FOR THE PRICE OF ONE! New Year's Eve is always a special holiday show at Sengelmann Hall, so we decided to give you triple music power in the dance Hall. Our three headliners are ROY HEINRICH & THE PICKUPS (7:15pm); THE TIM HALL BAND (9pm) and THE CHARLIE LUCAS BAND (11pm). Remember! This year, New Year's falls on a Saturday, so we can keep dancing til 1am! VIP ticket holders will receive early admission with preferred and reserved seating with an open Beer & Wine bar from 6pm-7pm, access to the "Backstage Pass Party" with band members before the show and a Holiday gift bag and free pourin' champagne! General Admission doors at 7pm. EVERYONE gets free pourin' champagne at 11pm and a complimentary breakfast upon departure! A pre set menu will be served in the restaurant including: Prime Rib rubbed with cracked black pepper, Filet Mignon Medallions served with Malbec coulis, fresh Red Snapper Stuffed with Potters Pecans & Green Pepper relish (our fish is shipped overnight from Santa Monica, CA) & Chicken Marsala served with Angel Hair Pasta. Side choices include: garlic mashed potatoes, macaroni & cheese with white truffle oil, Sengelmann Baked Spuds loaded and baked with cheese, sour cream and cheddar, topped with crispy bacon; steamed broccoli, roasted vegetables, and/or hand cut fries. Appetizers include: Fried Pickles & Mushrooms, Cheese Platter with fresh fruit & homemade preserves, BLT dip with grilled Shiner Beer Bread, Topinka bread and soup with a variety of salads. ABOUT ROY HEINRICH - Texas Honky Tonk Music at its Best! Want to experience music the way God and Hank intended it? Kick back at a Roy Heinrich show, and you'll hear the lonesome sounds of a man whose voice is too peppered with experience, lost love, and heartache to not be real. You'll also enjoy high-voltage honky tonk at it's best. And most of all, you'll share the experience with Roy as he puts one more honky tonk under his belt, one more night of singing, twanging and rocking, and one more night of plain and simple honky tonk music. And we just found out that Roy is a native from Schulenburg, TX! 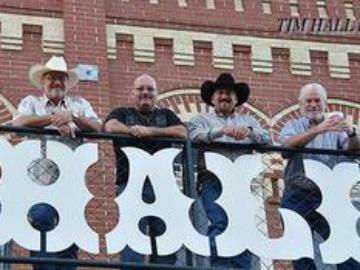 ABOUT THE TIM HALL BAND - Based in Fayette County Texas, The Tim Hall Band has been filling dance halls and honky tonks for the past several years. With their traditional country music foundation, they are committed to keeping the "Country" in Country Music. Though not limited to just country music, with Texas style music, outlaw country, top 20, some polka and rock, everyone will get in on the fun. Tim's band is a regular VIP at Sengelmann Hall and we are proud to have them back! No spittin on the dance floor. No throwin' things over the balcony either! Sorry, no refunds either.